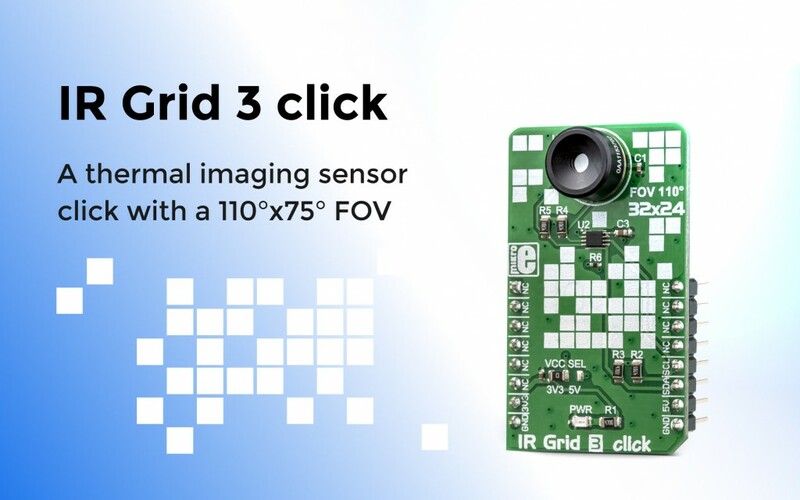 HomeBlogClick boardsIR Grid 3 – a thermal imaging sensor with a wider FOV. IR Grid 3 – a thermal imaging sensor with a wider FOV. Today is a happy day - we just released an even mightier thermal imaging sensor click – IR Grid 3! It has an array of 768 very sensitive, factory calibrated IR elements (pixels), arranged in 32 rows of 24 pixels. Each of them is measuring an object temperature up to 300˚C within its local Field of View (FOV). The MLX90640 IR sensor used on this Click board™ has only four pins, and it is mounted inside of the industry standard TO39 package. The Click board™ comes as a fully tested and approved prototype, making it a reliable device ready to use on the development board. The full package also includes the mikroSDK™ software and a library with all the functions. If you need to make a thermal scanner, or to precisely measure contactless thermal changes, or thermal leaks in your home, the click board™ will be perfect for you. There’s even a wider range of applications, including but not limited to industrial temperature control of moving parts, other types of heated object localization, human presence, and similar applications that require accurate contactless thermal measurement, or thermal imaging.